They call me the Fisherman. But I don’t fish for trout or creel or scallop. I fish for stories. And that is my gift, I need no bait for them to come to me. People see me and think I have but one good eye, but I have two and each serves its purpose just fine. The eye you see watches the waking world. The eye you don’t faces inward, and looks to the world beyond, a world more real and solid and dependable, the world of stories. I see them all if I look hard enough, all the ones connected to Merksay, anyway. I’ve lived here all my long life, Merksay is in my bones, and its stories run through my veins. It will always be part of me. That’s what the tale I have to tell you on this brisk and bitter Halloween night is all about, friend. Merksay is a place with a power to it, a hold that grips those born there or even those that dally there too long. The people of Merksay are caught like fish in a net, and no matter how far they stray, be it to the ends of the Earth, they never really leave. Merksay never really leaves them. Take Heather Connelly, who was living a contented life in Glasgow with her husband and newborn son. She thought she was free of Merksay. But the fish swimming in the net think they’re free too until it tightens around them and hauls them out of the water. Sit down, join me for a spell. I hope you don’t mind if I smoke my pipe. Let me share one of my Merksay stories with you. The story of Heather. Somewhere, the baby is screaming. That was the first thought to greet Heather as she was hauled out of what had passed for sleep. The 4:07 on the bedside clock flashed tauntingly at her, a reminder of the ever-closing window for any sleep on this night. She lay there for a moment, bleary eyes open, glaring hatefully ahead. She wasn’t expecting the crying to stop, she would never count herself so lucky. But she thought that maybe this time Craig would answer the call instead of lying on his side in the bed next to her, his back to her. He was breathing heavily, pretending to be asleep. Who could possibly sleep in this house!? She momentarily considered mule-kicking her husband in the kidneys, jolt his arse out the bed to deal with the noise. But instead, with a deep sigh, she rolled herself out of bed and shambled out of her room and across the hallway to tend to her son. Heather flicked on the light and tentatively approached the crib. Colin was still crying, but his ear-piercing wails faltered a little as he looked up at his mother, his eyes widening with base recognition and expectation. Heather glared down at this baffling creature that had grown inside her and been spat out unceremoniously into the world, and for a crazed moment she eyed him with the bemused, dispassionate disgust with which one might assess a removed mole or cyst popped into a glass jar and given back to you as a souvenir. Only here was an excised growth that she would have to feed and bathe and clothe, that she would have to care about… forever. The thought of how her life might be if little Colin were to go away never once crossed her mind. Not even here, at her most tired and desperate, did she even momentarily entertain the notion of being happier were the howling stranger stealing sleep from her were to disappear. Later, when the horror began, this is what Heather would insist to herself over and over. No wish from her, not even a subconscious one, started all this. Heather picked up Colin, rocking him gently as she paced back and forth across the room. She smiled and cooed down at him, hopeful it would mask her hard, glaring eyes, which were silently willing him to sleep. Finally, he did. Outside, the sun was starting to rise. The thought had frequently occurred to Heather that your world gets much smaller after you have a baby. Before, her life had been filled with both a demanding job and an active social life, each of which she’d managed to navigate deftly. Now, though, she was on maternity leave, and her friends rarely seemed to fit into her schedule, nor her theirs. Even Craig felt like more of a guest star in her life, popping in at night after work to eat and sleep. But Heather’s life had shrunk down to just her and her little boy now, her days filled with ways to keep him safe, happy and occupied. Today that involved a walk through the park, her pushing Colin along in his pram, patiently indulging the gasps and giggles from old ladies she passed along the way. The streets of Shawlands weren’t quite what you’d call scenic, but at this autumnal time of year “not raining” was about the best you could hope for. And more and more Heather relished the opportunities to get out of the house, even if it was just for a wander. Being cooped up in her house, just the two of them, was enough to stir up cabin fever. She could already feel her gut tightening at the thought of it as she drew in the pram towards her front door. And that was before she spotted the letter sitting on the ground in front of the door, placed in a solid black envelope. Heather didn’t think much of the letter at first, save for a mild curiosity over it not being posted through the letterbox like the rest of the mail. She assumed the postman must have dropped it, not even registering the fact that the envelope was entirely black, with no name or address written on its surface. It was only when she picked it up that a chill ran through her whole body, a nagging voice in the back of her mind screaming at her to throw it away, not to dare look inside. Then the rational part of her mind cast aside this silly thought. She steered the pram through her front door and into her hallway, then opened the envelope. YOuR HaPPy DaY HaS CoME! More confused than afraid, so she told herself, Heather nevertheless found her hand shaking as she opened the card. There was a message inside. YoU hAD YoUR ChiLD… THis tIMe. I aM VeRY pLEAsED. NoW yOU CaN HoNOuR oUR AgREEmENt. I SHalL CaLL oN YoU to CoLLeCt… SOON. The letter dropped out of Heather’s hands, and though she felt a scream rising from her gut, it caught in her throat. When she opened her mouth all she could manage were sharp, rasping intakes of breath. There was no name signed on the card, but she knew it was from. A name came to her lips in that moment, a name she hadn’t so much as thought about in over a decade. The girl sits sobbing on the kitchen floor, begging having given away to incoherent, defeated wailing. Her mother stands in front of her, unmoved, arms tightly folded in front of her. Emerging from the dark cloud of her thoughts, Heather looked across the dinner table at Craig. He was taking a turn at feeding Colin, with perhaps a quarter of it apparently completing its journey into his mouth. But Craig had paused in his task, now looking at his wife with concern. “No,” Heather replied, after a pause. Craig stood up and walked round behind Heather, hugging her. Heather smiled at him, feeling a little reassured. Talking about it rationally, Heather felt a little silly. Of course there was no such thing as Bonnie Shaw. It was just a scare story parents used to bully and intimidate their children into doing their bidding. That’s how it was used on her, anyway. And even if there was such thing, which there wasn’t, no deal on earth could make Heather give her Colin away. No way she was going to lose her child. Not this one. Hearing a stranger’s voice in your child’s bedroom would be enough to invoke terror in any parent. But Heather’s thought process did not even momentarily jump to the conclusion that an intruder had broken in. No, immediately she knew that it was the voice of Bonnie Shaw. She knew because the voice that she heard through the baby monitor was not human. It wasn’t what she would call an animal sound, guttural and growling. It was deep, silken, almost pleasant, but even through the monitor Heather could pick up on a reedy, unnatural quality to the voice that made it sound unlike any living thing. Or perhaps that is being too analytical. Perhaps she just knew, on some level, that of course he would come. But the answer to that was easy. Because it wasn’t just about her. Her son was in that room. So no matter what was in there with him she would run to him, as soon as she would run into a room that was on fire to pull him out. Heather could not see Bonnie Shaw in the bedroom when she burst in. And her breath caught in her lungs for a moment as it dawned on her that was because he’d already gone, already got what he’d came for. He’d snatched Colin and they had left together to whatever nightmare world Bonnie Shaw came from. But she exhaled in ragged gasps of relief as she noticed that Colin was still in his crib. But Heather’s relief curdled to dread as she peered into the cot. Colin was awake, and he looked ashen, too frightened to cry. He was staring, wide-eyed, but not at Heather. He was staring past her, up to the ceiling behind her. And in that moment, with terrible certainty, Heather concluded that Bonnie Shaw was up there, gripped to the ceiling, gazing down at them with his black, beady eyes. In her mind, she pictured him as being just like in the story books, all poorly proportioned limbs, overgrown head and jagged edges. 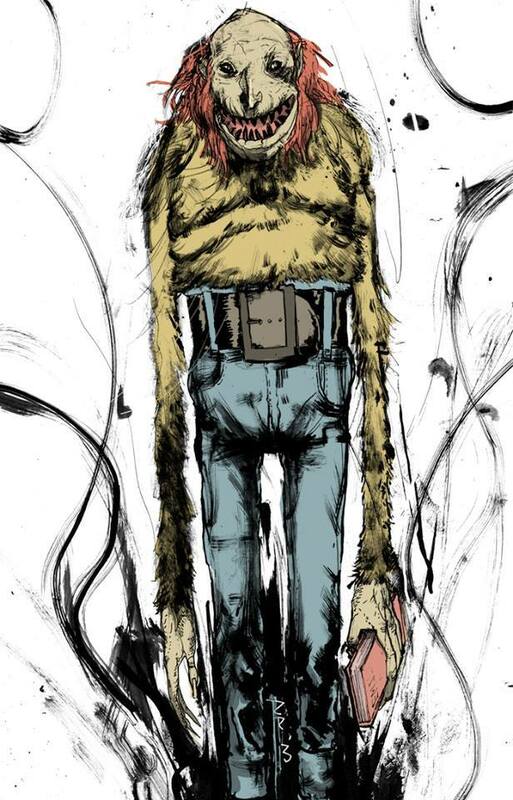 In fact, she imagined him as literally being a giant version of the story book ghoul that had frightened her as a young child, right down to only being able to imagine him as 2-dimensional, pressed flat against the ceiling, elbows creasing like folded up paper as his long claws started to reach out for her. She expected to turn and find him silently stifling a chuckle, like a naughty child hiding from an adult. Letting out an audible moan, Heather spun round quickly, turning to face the ceiling above her. There was nothing there. Or at least, whatever had been there was gone. It was barely a day after the incident with the baby monitor that Heather found herself on the Orkney ferry, the hills of Merksay looming ominously ahead. The last time she had seen this view, she had been on the boat heading in the opposite direction, and had vowed that she would never look on it again. And yet here she was, a decade later, returning home. And now she had her son with her, absently rocking the pram back and forth on the deck as she tightly gripped onto the handrail. She hadn’t said anything about the voice or the presence she’d felt to Craig, of course. She had just told him that she wanted to take her son to visit her family. Craig had initially been dubious, knowing that not only had he never met Heather’s parents but she never talked about them, but he soon came round to it being a good idea. Maybe he was jumping at the chance to have the house to himself for a bit. Walking through the roaming fields of Merksay, it was like she’d never left. Maybe the life she’d lived since then, the intervening years where she had become an adult, got a higher education, found a job she was great at, fell in love with a man and married him, and had a beautiful son, had all been a longing daydream, and she’d never escaped this place after all. But the pram she was pushing ahead of her gave lie to that notion. It wasn’t easy going, the ragged terrain ill-suited to the wheels. Navigating the island took longer than she thought as a result, and the daylight – gray and listless at the best of times here – was already waning when she came across her old family house. It looked so small, now. She opened the rickety gate and tentatively made her way up the path towards the crooked, stone-cobbled structure before her. This was no longer home to her, if it had ever been. She had no desire to be here, certainly not for the reconciliation Craig had bought into. She told herself that this trip was purely about information. Heather knocked on the door, and for a few silent, hopeful moments there was no answer, and she entertained the comforting idea that the house had been abandoned. But then the door opened, and Morag Creig, Heather’s mother, was standing at the threshold. It appeared that time had withered Morag Creig. Heather hadn’t seen her in the 10 years since she’d left for Glasgow. Just as resolutely as Heather had vowed never to return, Morag had long ago pledged never to leave, and she had stuck her guns much longer than her daughter. But she looked like she had aged twice as much, her hair now a shock of white, her stature shrunk, her back stooped. But she still had the same hard eyes, which were now coolly assessing the woman standing on her doorstep, and the baby she brought in tow. After what felt like an eternity, Morag was the one to break the silence. Little conversation passed between mother and daughter in the ensuing minutes, with most of it being about the particulars of the passing of Heather’s father. And Morag did not even acknowledge her grandson until well after they had all sat themselves in the tiny kitchen, Heather’s untouched tea going cold. Heather felt the bile rising in her throat. With a struggle, she swallowed it down. And with the very mention of the name, Heather saw Morag’s eyes widen in fear. Heather launched herself to her feet, standing up with enough force to knock the chair behind her to the ground. She was trembling with anger. Morag just looked down at the ground. Shaking her head with contempt, Heather continued. Finally, Morag had found her voice, glaring at her daughter. Morag slumped back into her seat, horrified. At first, Morag shook her head absently. But then, realisation dawning her eyes, she turned to face her daughter. Heather could not believe what she was hearing, looking on in dumbfounded silence as Morag laid out this morbid scenario. When she finally did reply, her voice was low, shaking with rage. Morag took the words like daggers to the chest, shrinking back into her chair, her face etched with shame. And with that, Heather wheeled Colin’s pram around and left the house, never once looking back. Night had fallen on Merksay, and Heather was still pushing the pram through the fields, desperately trying to remember where to find Baubie’s Bed and Breakfast. She let out a scream as a front wheel caught on a jutting rock, snapping the wheel off and causing the pram to slump to its side. In her mad scramble to catch the pram as it collapsed, Heather herself lost her balance, ending up in a heap on the ground. She was scratched and battered, but thankfully, Colin was still nestled in his blankets inside the upturned pram, looking bewildered about being on his side, but nothing worse. Heather abandoned the pram after that, choosing to carry Colin in her arms. She limped through the green wilderness, and she could swear that there had been houses here before, but now there was nothing but long grass. It was if the island itself was shifting around her, conspiring to leave them lost and alone in the dark. Then, about as far ahead as Heather was able to see under the light of the moon, something moved in that long grass. She told itself it was just a fox, that they were known to wonder here. 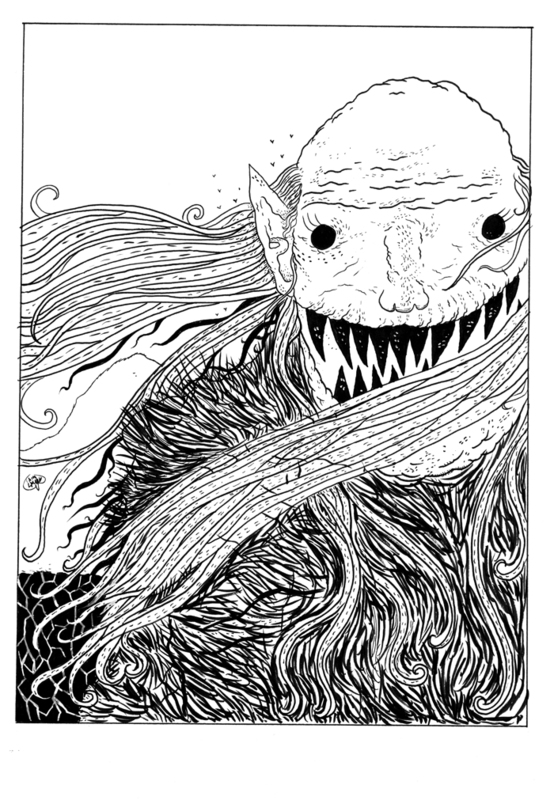 But then that something rose up far beyond the grass, its long, spindly limbs attached to a bulbous, misshaped torso, a mess of hair all over. Was the shape rising up from a crack in the ground, some portal from another world, or had it been here the past decade, lurking in the grass, waiting for Heather to come to this exact point with her child in hands, ready to be delivered? Bonnie Shaw stretched his arms out wide, head arched upwards to the moon. Then he turned to look at Heather, and smiled. Up until that moment, Heather had been transfixed, watching this beast take form out of the darkness in a state of dreamlike terror. But once Bonnie Shaw turned his attentions onto her and her boy, she found the wherewithal to run, screaming into the night as she did. With the adrenaline kicking in, she wasn’t even limping anymore, pounding through the fields with her son clutched tight to her chest, even though she didn’t have a clue where she was running to. Knowing what she was running from was enough. But none of it did her any good, the screaming or the running. The screams went unanswered. And every time she dared look over her shoulder, Bonnie Shaw was still there. He did not seem to be any hurry, her mad dash contrasting with his slow, casual walk. And yet every time she looked he seemed to be a little bit closer than he had been the last time. Then there was nowhere left to run. Heather found herself standing at the edge of the cliff-face, looking down at the black, tumultuous waters below. She turned around, and Bonnie Shaw was THERE, standing right in front of her, towering over her. Heather grabbed a large stick off the ground and started swinging it wildly, a savage protective instinct taking over her. But Bonnie Shaw just smiled, unfazed by the blows to his body, letting her strike at him until she was exhausted and dropped the weapon of her own volition. But Bonnie Shaw just shook his head at this foolish idea. Heather started to sob uncontrollably, backing further towards the edge of the cliff. A long, clawed hand stroked gently down the side of Heather’s cheek, wiping at her tears. Tears streaming down her face, Heather shook her head, taking another step backwards. Now, at last, Heather pulled her eyes away from Bonnie Shaw. She looked down lovingly at her son, Colin, gazing deep into his curious eyes, taking in every little detail of his face. “Yes,” she whispered, never looking away from her son. Bonnie Shaw grinned, reached a clawed hand out towards her. It was a beautiful day in Glasgow, unseasonably bright and sunny for October. Heather walked through the park with Craig by her side. The thought occurred to her that she should cherish the little joyful moments like these as they were happening, and so she did just that, drawing in closer to Craig and resting her head on his shoulder. They looked into each other’s eyes and smiled. Colin was with them. She pushed the pram in front of her, and he looked back at his parents, giggling playfully. Everything was going so well. Soon she would be back at work. But not until after Christmas. Their first Christmas as a family! Just this morning she’d phoned her mother, who was so excited to make the trip out to Glasgow to spend Christmas week with them. It was all exactly as it should be. Somewhere, your baby is screaming. Then Colin smiled at her, and Heather immediately forgot such foolish notions before they had even formulated as coherent thought. And Heather lived a happily ever after, of a sort, in Glasgow. But part of her, perhaps the most important part, is forever here in Merksay. It’s the part we all leave here. And so many of us have stories to tell. One day I may tell you another. But not tonight. The light is fading, and the chill is setting in. Off you go now to carve your turnips and go guising in your fancy dress. Be merry, enjoy the festivities. Silly old stories like this shouldn’t linger for long amid all the fun. But maybe, once the decorations are gone and the costumes are back in the cupboard, when you lie awake at night, they’ll come a-calling once more. Happy Halloween. 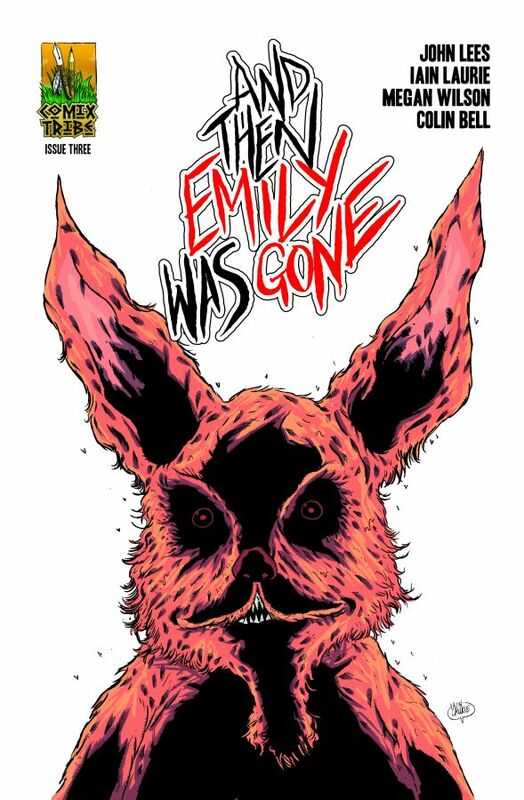 Tomorrow: FCBD, And Then Emily Was Gone #0! Tomorrow, Saturday 2nd May, is Free Comic Book Day! It’s the day that, all over the world, comic shops offer a selection of free comics to welcome in readers old and new. It’s a wonderful opportunity to celebrate comics, and to introduce other people to an exciting, vibrant medium of entertainment, so make sure to find out what your local shop is doing to mark the occasion, stop on by to pick up some free comics, and also support your retailer by buying something while you’re there too! Amidst all of the quality free comics titles from the likes of Marvel, DC and Dark Horse on offer, ComixTribe are offering And Then Emily Was Gone #0. 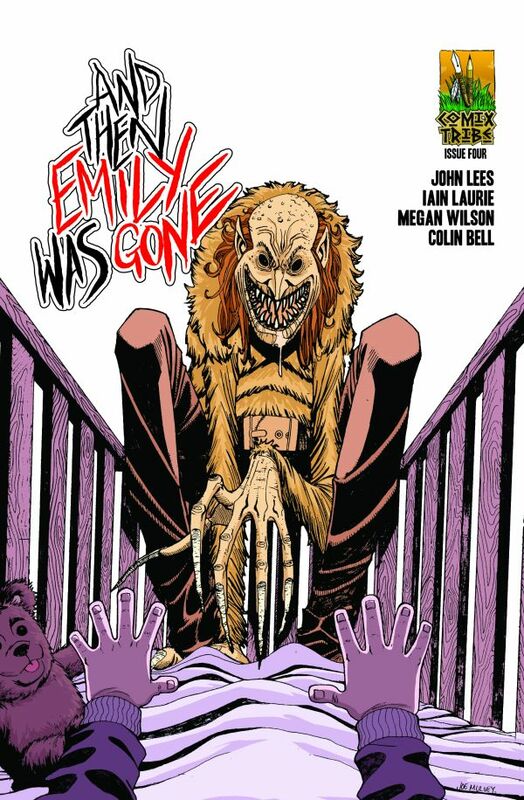 This comic features a new And Then Emily Was Gone story, a prequel to the events of the series, which reunites the whole creative team of writer John Lees, artist Iain Laurie, colorist Megan Wilson and letterer Colin Bellfor our most terrifying story yet. In addition, there’s a back-up story featuring ComixTribe’s flagship villain, The Oxymoron, written by Tyler James and drawn by Alex Cormack. 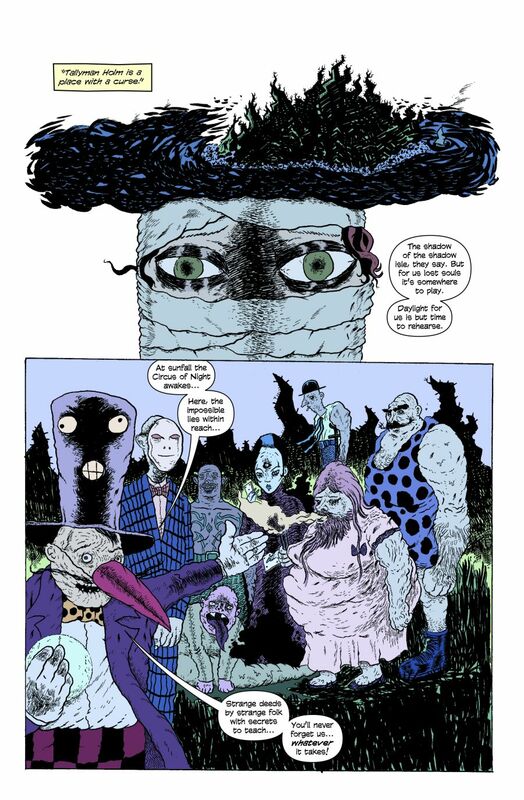 If that’s not enough, there’s also an interview with Tyler James and John Lees about their new Oxymoron series, Oxymoron: The Loveliest Nightmare, which launches this August. 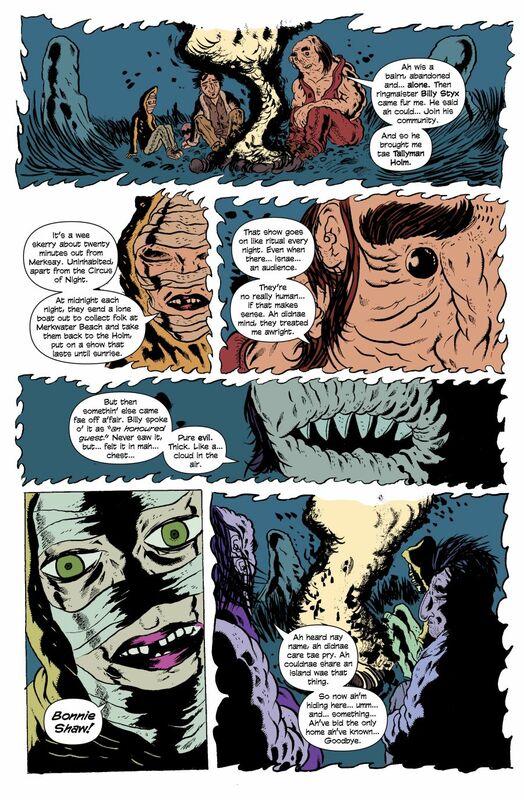 All that, and we have previews and reveals of upcoming ComixTribe projects, and even a contest where you can win a free graphic novel! And on top of all that goodness, the cover is drawn by comics superstar Ryan Stegman (Amazing Spider-Man, Wolverine, Inhumans). “What’s real and what is a fever dream? 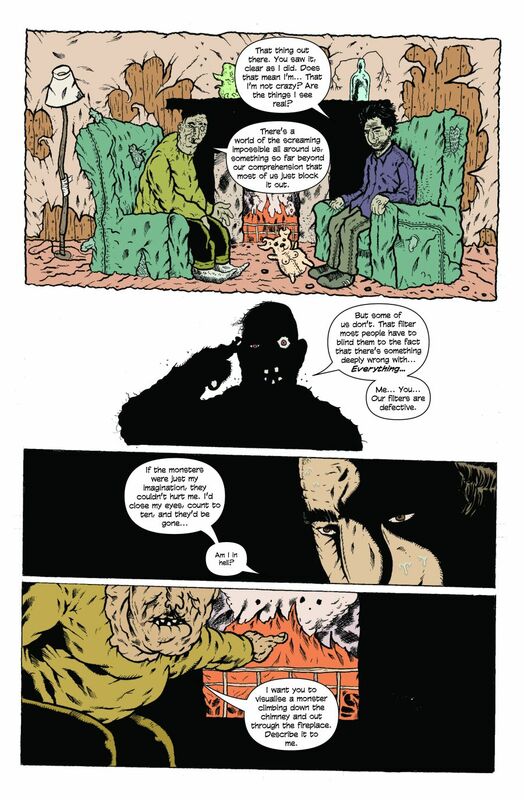 It’s unique in the sense that the hairs on the back of your neck prick up and you have to remind yourself… oh right, this is just a comic book. 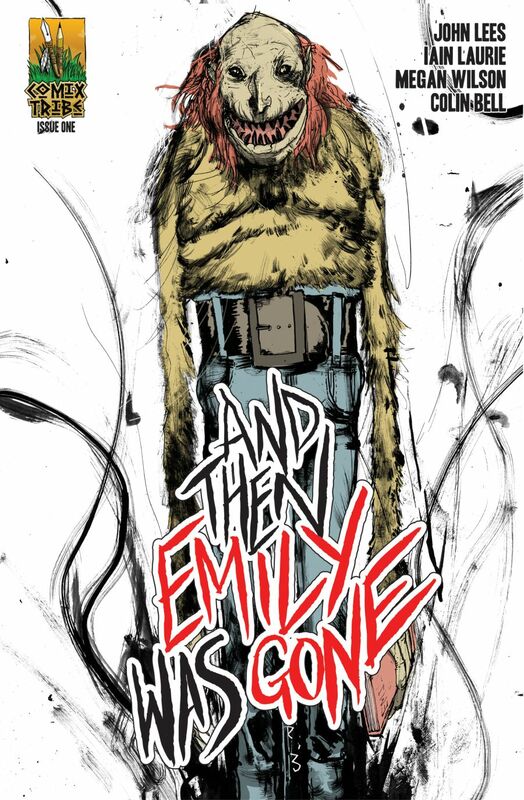 To celebrate the release of And Then Emily Was Gone #0 tomorrow, And Then Emily Was Gone writer John Lees will be signing copies of the book at Forbidden Planet Glasgow, from 9am-11am. Oxymoron artist Alex Cormack will be signing and sketching at Hall of Comics in Southborough, Massachusetts, and Oxymoron writer Tyler James will be at the Jetpack Comics FCBD Festival in Rochester, NH. If you’re near any of these shops, stop by and say hello to the broken, lonely souls who worked to get this comic into your hands! Free Comic Book Day is always great fun, and is one of the biggest days on the comic book calendar: Christmas for geeks! So, make the most of it, visit your local comic shop bright and early tomorrow, and pick up your copy of And Then Emily Was Gone #0. And you can do one more thing for us. Once you find a copy of the comic, take a pic of it on the shelf or in your hands, and post it on our Facebook page, or post it up on Twitter using the hashtag #EmilyFound. Give us an idea of how many people are discovering our comic on Free Comic Book Day! And Then Emily Was Gone… In Shops Worldwide TOMORROW! Tomorrow is a huge day for Team Emily. 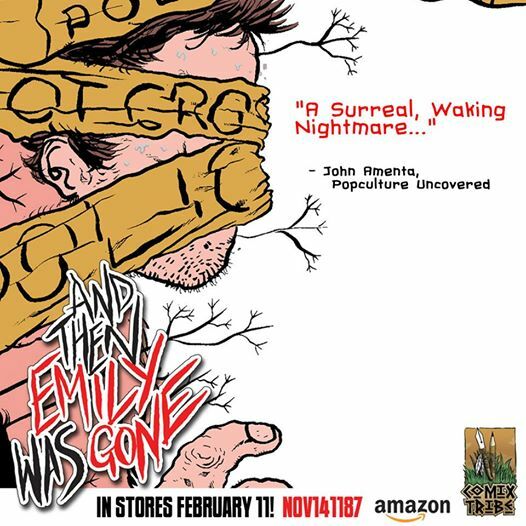 After each of the 5 single issues being released over the course of last year, tomorrow – Wednesday, February 11th – sees the worldwide release of And Then Emily Was Gone, complete and collected as a graphic novel. For this post, allow me to talk to you as John Lees, writer of And Then Emily Was Gone. See, having this series released in comic shops across the world was great, and having it do so well and people respond to it so warmly has been nothing short of incredible. But to have a comic of mine be finished, and bound up as a trade paperback… that is a career milestone for me, a life-goal I’ll be able to tick off and say I’ve accomplished. 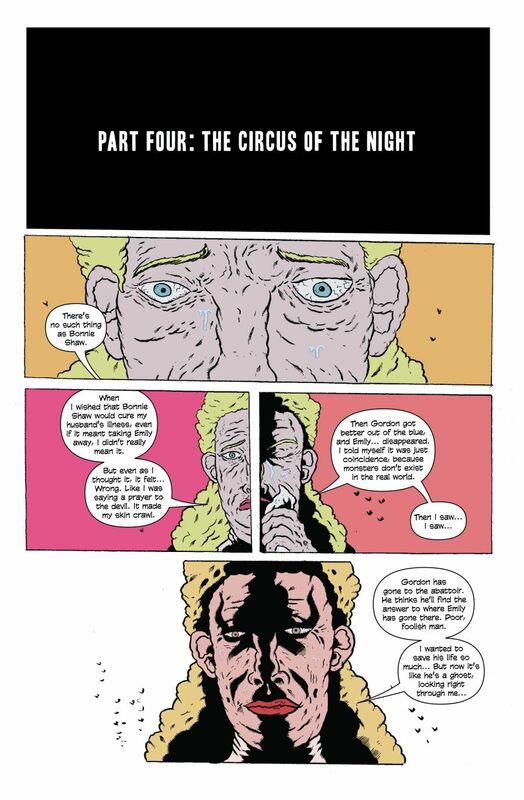 As a writer, your comic has a lot of “endings”: when you write “THE END” at the bottom of the last page of the script for the last issue… when the last page of artwork arrives in your email inbox… when all that art has been coloured and lettered… when the last issue has been released in comic shops. But for me, the moment that And Then Emily Was Gone will truly be done is when I hold a copy of this graphic novel in my hands, slide it into the place I have made for it in my bookshelf, and close over the door. So, even if nobody buys this book when it’s released tomorrow… I’ll still be realising a dream. I’ll have a completed work of fiction published and out there in the world. 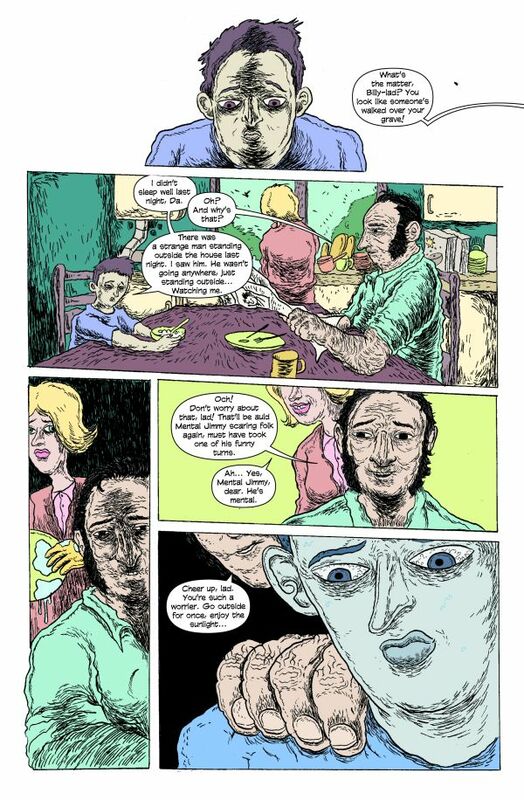 And though single issues sell out and become increasingly scarce after a few months, this graphic novel is the form that And Then Emily Was Gone will reside in for some time to come, hopefully to remain in circulation to some degree for a good while into the future. It really makes me deeply happy to think that, even as the active life-cycle of And Then Emily Was Gone draws to a close, the series will be out there – in the form of this graphic novel – on comic shop shelves, or available from Amazon, waiting to be discovered by more readers. 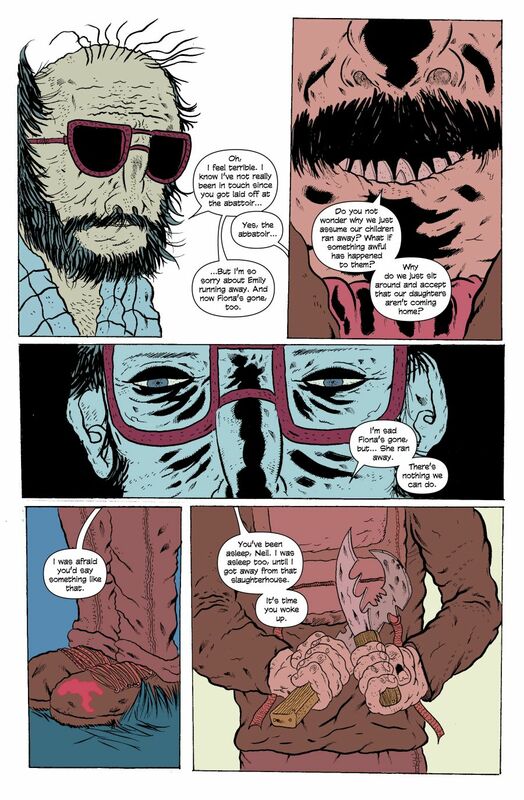 Over on the ComixTribe website, publisher Tyler James wrote an excellent analysis of the journey And Then Emily Was Gone took from pitch to publication, the triumphs, the pitfalls, and the lessons learned. It’s fascinating reading, and should be informative for anyone looking to release an indie comic book. And one thing that hopefully emerges from that article is that And Then Emily Was Gone is a labour of love for us. Iain Laurie and I created this book together, with the idea being that we wanted to tell a comic that we would love to read, even if nobody else did. And hopefully that (sick, twisted, perverse) love oozes off every horrific page. I want to thank ComixTribe for having faith in us and putting their support behind us. 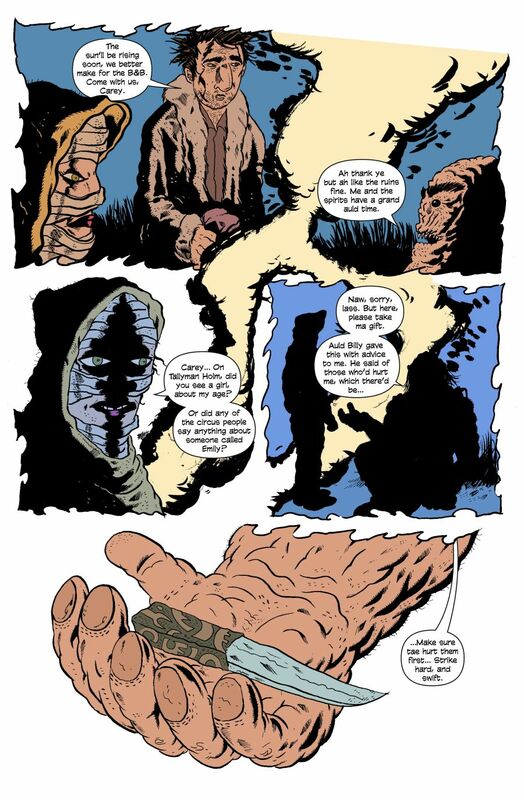 I want to thank Colin Bell, the most dependable, gifted letterer in UK comics, whose value as a creative collaborator and sounding board for ideas should not be undervalued. 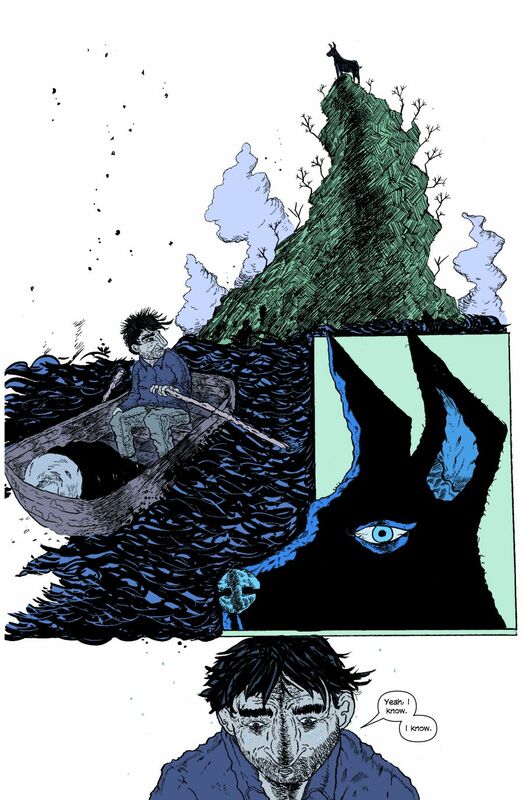 I want to thank Megan Wilson, whose stunning colours transformed this comic and elevated it to a whole other level, taking it from Glasgow indie to a book ready for the world stage. 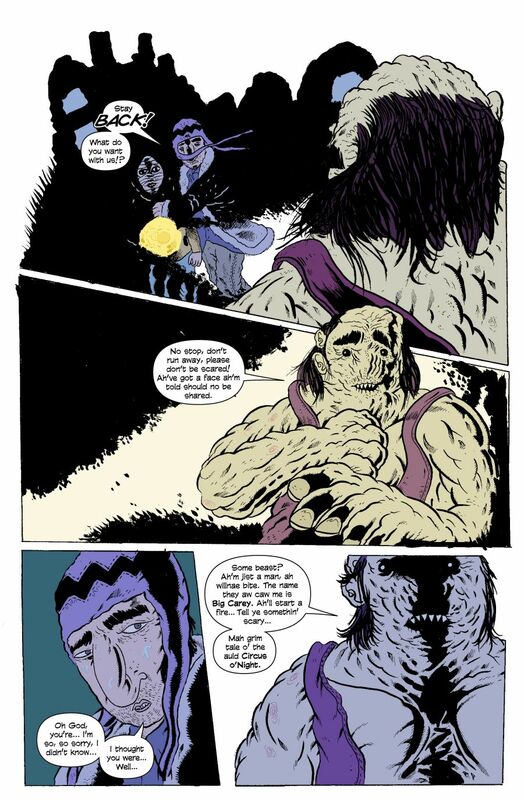 I want to thank Iain Laurie, my comics soulmate, who I’ve had a more enjoyable, rewarding collaboration with than I can imagine ever having with anyone: the man is a genius, an inspiration, and a comics hero of mine: he’s still one of my favourite artists, and now I’m thankful to also count him as a friend. And if I’m very lucky I’ll be able to keep on working with him for a long time to come. 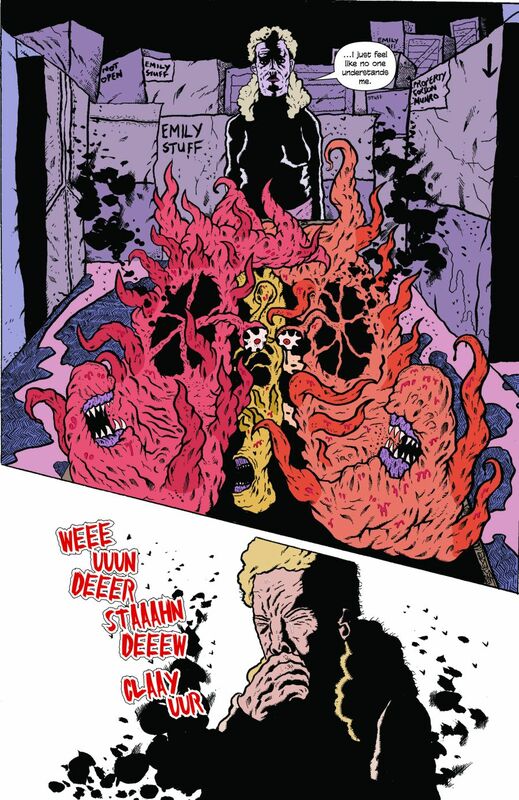 A huge thanks to every retailer who took a chance on our weird little Scottish horror comic. And most of all, a massive thank you to every single one of you who bought the book, read the book, and talked about it. We’d be nowhere if it wasn’t for you. And for any readers still on the fence, why not download the first issue for free RIGHT NOW to see if you’re interested? Then if you are, you can hope along to your comic shop tomorrow to buy the full story! So, once again, thank you all. And remember, the mystery of Bonnie Shaw and Merksay is not yet over! And Then Emily Was Gone #0 is coming on Free Comic Book Day, with an amazing cover from Ryan Stegman. Find out more about that here. 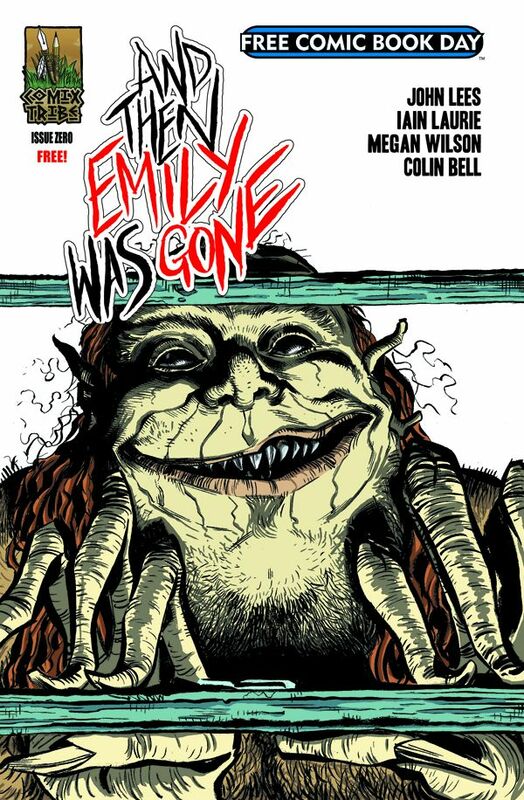 Coming Free Comic Book Day… And Then Emily Was Gone #0! Happy New Year, everyone! 2014 was a fantastic year for And Then Emily Was Gone, with the series getting a worldwide release and enjoying much acclaim and success. But 2015 is set to be even bigger, starting with the launch of the collected edition of the series in comic shops in just a couple of weeks (order code: NOV141187). And then, on May 2nd, comic shops around the world celebrate the biggest day on the comics industry calendar: Free Comic Book Day! 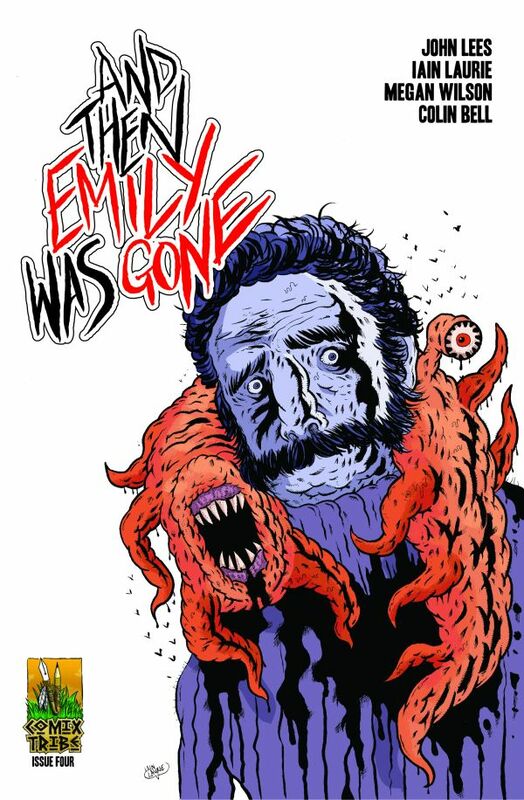 ComixTribe and Team Emily are proud to announce that joining the exclusive lineup of Free Comic Book Day titles this year will be And Then Emily Was Gone #0! Readers, if you want to make sure your local comic shop will be stocking And Then Emily Was Gone #0 on Free Comic Book Day… ask them! Free Comic Book Day is on May 2nd. 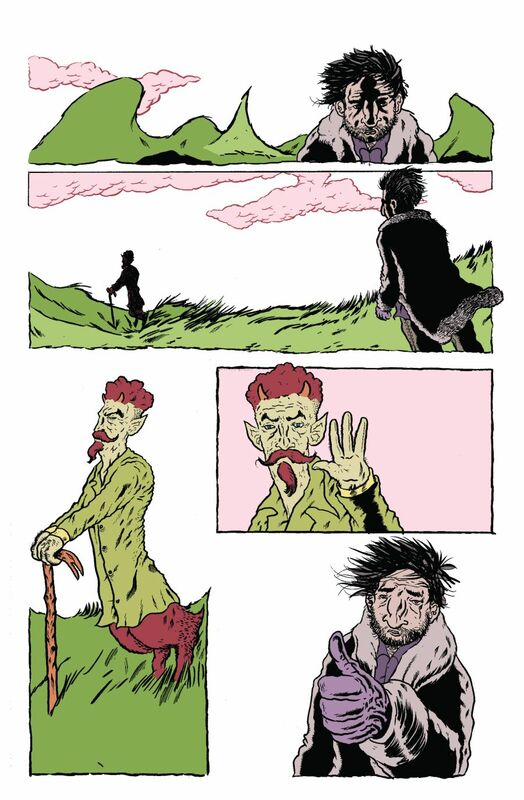 We’ll leave you with this little sneak peek at the first couple of pages of the story. And Then Emily Was Gone #5 Released Next Week! The end is nigh! And Then Emily Was Gone began as the cult hit of the summer, and after an autumn packed with growing critical momentum and convention success, this winter brings with it the final chapter and the resolution of the mystery of Emily Munro’s disappearance. This is without a doubt the darkest chapter of all, as things enter into bleak, terrifying territory. Find out where Hellinger and Fiona’s twisted journey takes them when And Then Emily Was Gone #5 gets its worldwide print release on Wednesday December 17th, one week from today! For all of you who have been following this series since issue #1, thank you so much for traveling with us this far. I hope you find this conclusion satisfying. As one final tease, here’s the preview that ran on Comic Book Resources earlier this week, along with another look at the stunning variant cover by Cody Schibi. 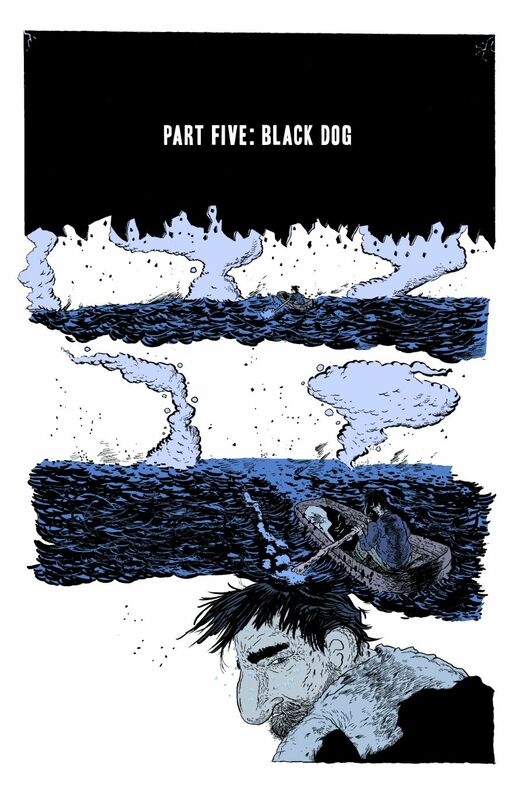 And Then Emily Was Gone #5 will be available to buy from comic shops worldwide on Wednesday December 17th. First of all, a huge thank you to EVERYONE who has supported And Then Emily Was Gone up until now. All the retailers who took a chance on stocking the comic, all the reviewers who have spread the word, all the readers who have bought the comic and shared their love and enthusiasm for it. It’s all made a huge difference, and made this series a huge success beyond any of our expectations. But now we need you all once again. Month after month, the story of And Then Emily Was Gone has been the same: the retailer supply underestimating consumer demand, leading to bulk reorders and fast sell-outs. 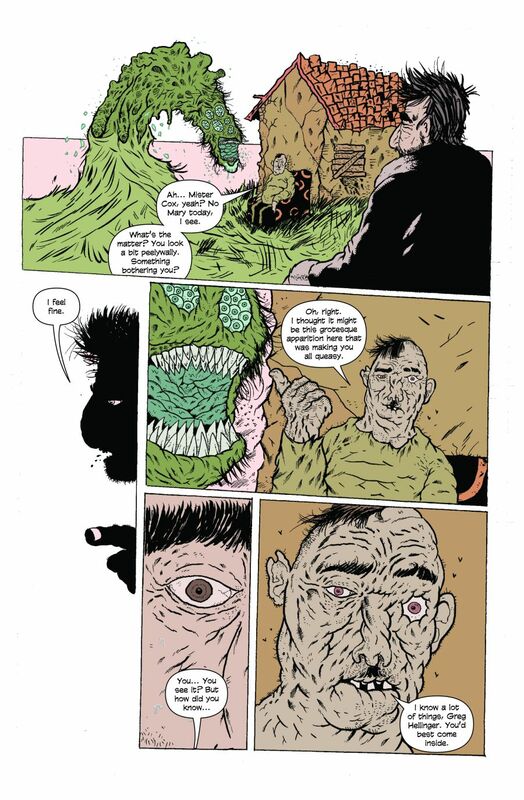 And while it’s great press to say we’ve had a sell-out, I for one would much prefer to be able to have the comic readily available for anyone who wants to read it, whether it’s now, a month from now or a year from now. 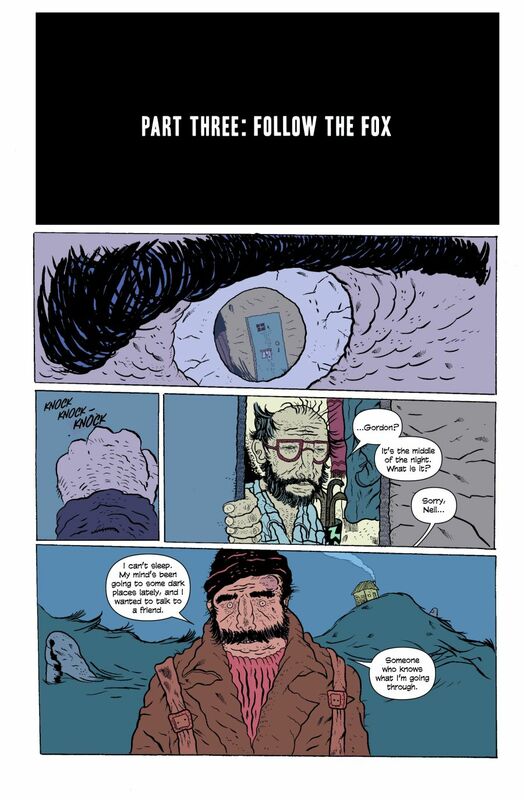 This graphic novel is our chance to do just that. Once the serialization of the series is done, it’s as a collected edition that And Then Emily Was Gone will have continued life. This is the format people will hopefully be able to discover the series in the future. And so all of us at Team Emily want this graphic novel to make as big a splash as possible, to be well-stocked in as many comic shops all over the world as possible. Help us do that. Retailers: if you’ve given us a try in the single issues, or even if you haven’t but you’re curious about the series, please consider ordering this collected edition: Previews page 293, NOV141187. Let us know what we can do on our end to make this a more enticing sale for you, what we can do to encourage you to devote some shelf space to our book alongside all the high-profile releases making demands on your attention and budget each month. Readers: whether you’ve been buying this series at your local comic shop each month, or you’ve been downloading it via ComiXology, or if you’ve bought the comics at a convention, or if you’ve not read the series at all yet but are interested in doing so, contact your local comic shop and request they order And Then Emily Was Gone: Previews page 293, NOV141187. 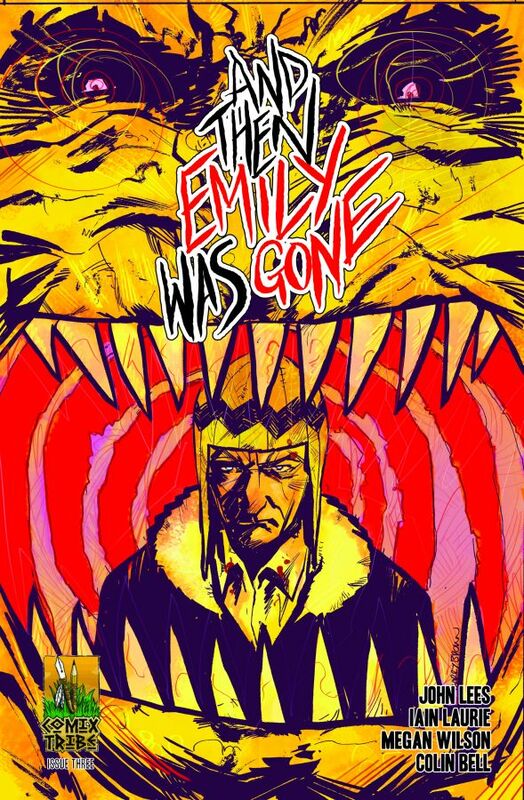 And Then Emily Was Gone is a big gambit for publisher ComixTribe: this is the first time they’ve went straight to the direct market in releasing a graphic novel as opposed to running a Kickstarter first. They feel the demand is there, and it’s worth the risk. Team Emily are all emotionally invested in that show of faith paying off. We’re all so proud of this weird, scary little horror comic that’s outperformed beyond our wildest hopes and expectations, and now our latest lofty goal is to crack the graphic novel bestseller lists with this thing! Let’s work together and ensure that Bonnie Shaw haunts as many comic shops as possible throughout the world. NOV141187! NOV141187! NOV141187! And Then Emily Was Gone #4 Released Next Week! 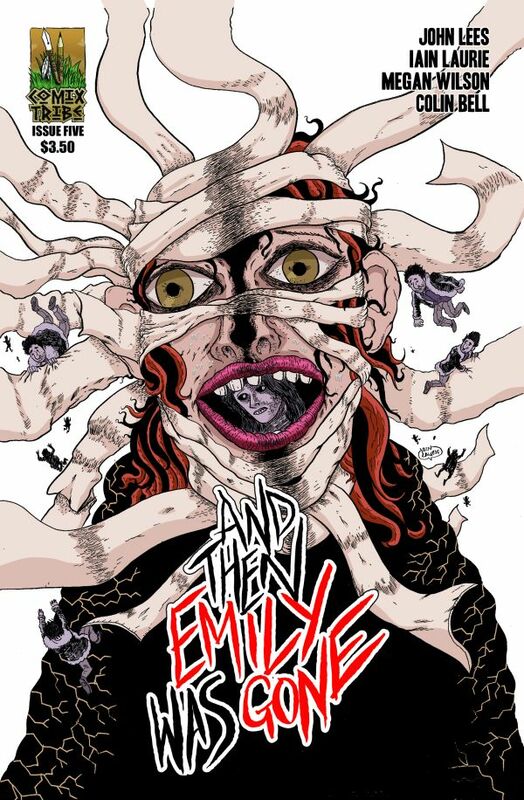 Fresh off the rip-roaring success of New York Comic Con (more on that soon, hopefully), the time is now fast approaching for the release of And Then Emily Was Gone #4. The comic is released in comic shops worldwide, and on ComiXology, one week today, on October 29th… just in time for Halloween! This issue, things get really intense. If you thought the first three issues were chilling, this is where things really go off the rails and plumb the depths of insanity. And Then Emily Was Gone #4 is so horrifying, the solicitation text had to include a note of caution, “Warning: The publisher and creators can accept no liability for any distress, trauma or nausea caused by the upsetting imagery in this issue.” You can find out for yourself how the sausages are made by picking this up next week, but to whet your appetite, we have assembled an exclusive preview, along with another look at the terrifying cover by Joe Mulvey, creator of Scam. And Then Emily Was Gone #4 is available from Wednesday October 29th. Happy Halloween! Find Emily at New York Comic Con! From Thursday October 9th to Sunday October 12th, New York Comic Con – one of the biggest comic conventions in the world – returns to the Javits Center in New York City. And fans of And Then Emily Was Gone will be pleased to know that the series is set to have a big presence at the show. 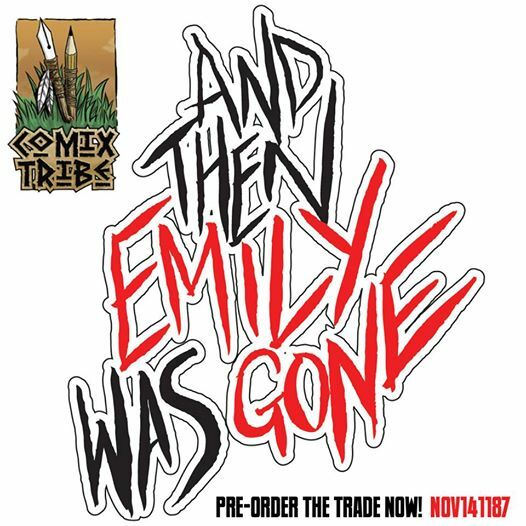 ComixTribe, publisher of And Then Emily Was Gone, has taken out a massive chunk of retail space on the show floor, spanning across tables 1172 and 1271. It’ll surely stand out as the king of the small press section for all attendees. And in amidst the array of books available and exclusives debuting at the show, we’ll be selling issues #1-#3 of And Then Emily Was Gone. Not only that, but we’ll be selling convention-exclusive artist’s editions of issue #1, on which you can have a custom cover drawn by the array of artists who’ll be stationed at the booth, including Alex Cormack (I Play the Bad Guy, Future Proof, Oxymoron: The Loveliest Nightmare), Joe Mulvey (Scam), Tyler James (Over) and Cesar Feliciano (The Red Ten). If you’ve already bought And Then Emily Was Gone and are looking to get your copies signed, you’re in luck. Travelling all the way over from Scotland, writer John Lees and artist Iain Laurie will both be in attendance at New York Comic Con! John will be at the table most of the weekend, while Iain will be stopping by for scheduled signings. Colorist Megan Wilson will also be in attendance and hopefully joining in for some group creative team signings, at which letterer Colin Bell will be represented by a wicker effigy. In addition to the core creative team, you’ll also find some of our all-star array of guest cover artists in attendance at the show. Nick Pitarra (The Manhattan Projects, The Red Wing), cover artist for And Then Emily Was Gone #2, will be in Artist Alley, table R2. And right next to him, at table R3, you’ll find Garry Brown (The Massive, Iron Patriot, Catwoman), cover artist of And Then Emily Was Gone #3. 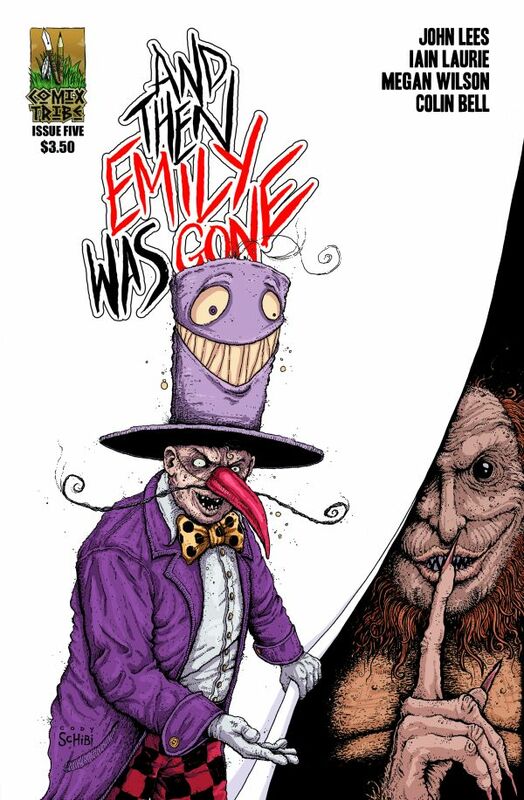 And back at the ComixTribe booth you’ll find Joe Mulvey, cover artist for the upcoming And Then Emily Was Gone #4. While you’re at the ComixTribe table, be sure to check out our whole range of comics, including all 5 issues of The Standard by Emily writer John Lees, 6 issues of The Red Ten, the first 2 issues of Epic, all 4 issues of Scam, and our irresistible deluxe hardcover graphic novels, including The Oxymoron, Scam: The Ultimate Collection and The Red Ten, Volume 1. We’re also debuting a special convention-exclusive advance preview edition of Oxymoron: The Loveliest Nightmare #1, written by John Lees and Tyler James, and drawn by Alex Cormack. On top of all that, we’ll have a massive selection of original art prints, and all sorts of other goodies. ComixTribe, Booths 1172 and 1271: note it down… that’s where you’ll find Emily! And Then Emily Was Gone #3 Released Next Week! The time is nearly upon us once more! On Wednesday 1st October, And Then Emily Was Gone #3 is released in comic shops worldwide. Issue #3 is our first issue to have experienced advance reorders before its date of release, as growing buzz over the first two issues has sent retailers back to the presses to get their shipment orders of this comic bumped up. After the introduction of the first two issues, it’s with And Then Emily Was Gone #3 that things start to get seriously deranged! 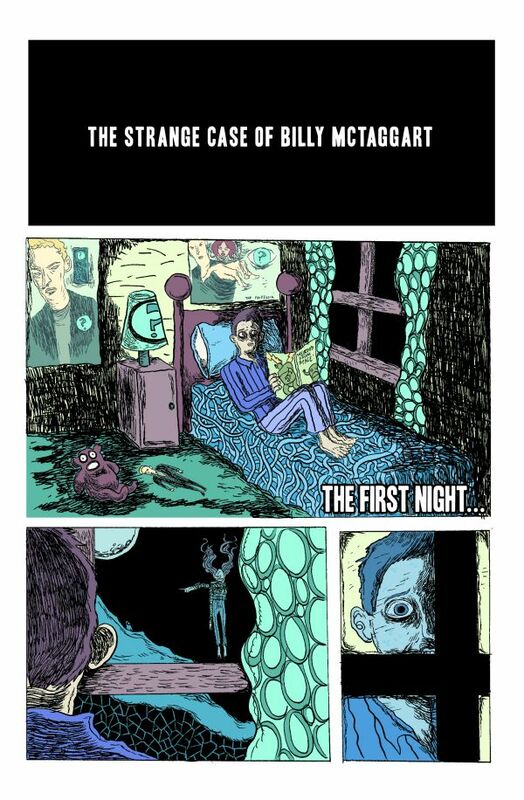 And Then Emily Was Gone #3 was actually released early on ComiXology, so you can read the comic digitally now. But for those of you who wait for print, there’s just one week to go. To tide you over, Comic Book Resources posted up a preview of the third issue, which we’ll also share now, along with another look at that incredible 50/50 variant cover by Garry Brown, the acclaimed artist of Iron Patriot, Catwoman and The Massive. Are you ready to follow the fox? Coming Soon: And Then Emily Was Gone #5! It is a great day for news here at Emily HQ. Today, one week after And Then Emily Was Gone #2 debuted worldwide to sell-out success and critical acclaim, the Diamond retailer orders for And Then Emily Was Gone #4 came out. These numbers were particularly significant to us, as issue #4 was the first issue available for retailers to order after the first issue had been released… monthly comics, folks! Typically, you expect a decline in sales from issue to issue in the direct sales market, so were hoping that the fall wouldn’t be too steep. Instead, we were pleased to discover that sales for issue #4 are UP 31% from sales of #3! That’s an incredible win, and one we’re all buzzing about! So, thank you, retailers, for having faith in this weird little comic. Please, even if your local comic shop has stocked every other issue of the series, don’t forget to ask them about this one, make sure they’ll be stocking it. You’re going to want to know how the story ends! We are all immensely proud of this final chapter, with the creative team all feeling like they have saved their best work of all for this series for the last issue. We can guarantee this will be one of the scariest things you’ll read all year! The cult horror sensation reaches its devastating conclusion, with the darkest chapter of all. Their search for the truth behind Emily’s disappearance has pushed Hellinger to the brink of insanity and left Fiona in terrible danger. Now, everyone will find what they’ve been looking for – and will wish they hadn’t! Questions will be answered, mysteries will be solved, and visceral terror awaits. And Then Emily Was Gone #5: in stores November 26th. SEP141227! SEP141227! SEP141227!